Join us along with a cornucopia of Boston’s finest creative talent at AIGA Boston’s Cross-Org AFTA. Enjoy drinks, light refreshments, and seeing what others are doing. Take advantage of this unique opportunity to shake things up and rub shoulders with other creatives from a wide range of fields and disciplines and show off! They’re taking JPG submissions so that everyone can see what you’re up to*. Feel free to tack on our logo as well. Please submit up to 5 photos, art, and/or design work of yours as JPEGs, sized to 1024 (w) X 768 (h) max, 72 ppi, sRGB. Name your image files with your last name and number that will help the images show together in the slide show (example: smith01.jpg) Please put your name as well as the organization you are with, on each of the images, so it can be visible when projected. All images must be submitted ahead of time, by January 24th to asmpne@gmail.com. Discretion will be used with any questionable material. Have questions? Suggestions? Get in touch with us via our Contact Page. If you would like to be a contributor to Creative Relay's resources, please email Ed. 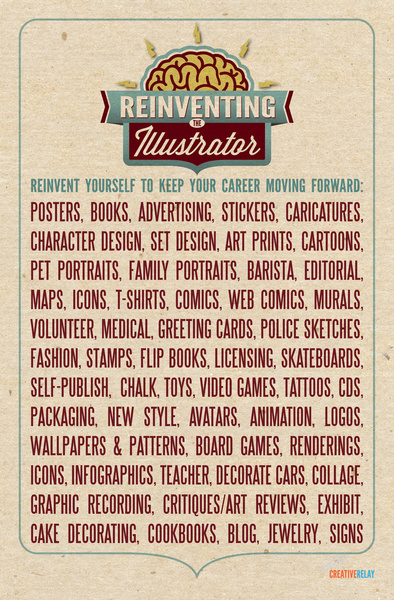 Copyright © 2019 Creative Relay – Resources for the Evolving Creative Professional. All Rights Reserved.